Western donors understandably tread warily in Zimbabwe where ZANU PF remains the overwhelmingly dominant governing party in a formal coalition government. The “Inclusive Government” (IG) was formed in February 2009, following the signing of the Global Political Agreement (GPA) in September 2008 by ZANU PF, Tsvangirai’s MDC (MDC-T) and a smaller MDC formation. Western governments, initially opposed to the formation of a coalition government, continue to enforce travel bans and asset freezes against ZANU PF individuals and ZANU PF-affiliated entities. ZANU PF has persisted with its strident animosity to Western governments and donors, and has made these sanctions policies a major reason for stalling on the implementation of the GPA. While ZANU PF blames the sanctions for retarding economic recovery, Western bilateral donors rightly point to their substantial humanitarian aid – nearly US$651 million or 15-20% of GDP in 2009. This aid also happens to boost the image of the MDC parties, which were allocated Ministerial control of services, including health and education, while ZANU PF ensured it retained the security and foreign affairs Ministries, among others. The role of Western foreign aid in this highly polarized internal politics is surely one reason why analysts have not focused much on its actual political impact. Instead, the politics of the political parties’ discourse or rhetoric has received much more attention, with particular focus on how ZANU PF depicts the West as undermining national sovereignty and seeking regime change. Another reason for the relative dearth of analysis about the political effects of foreign aid would seem to be some acquiescence that Western donor aid has generally benefited the opposition forces, chiefly MDC-T and civil society organizations, as intended. Using a few cases drawn mainly from recently published reports whose main concerns were not about foreign aid, I highlight some dilemmas of foreign aid in Zimbabwe today. These cases suggest that, as in many other countries (Gourevitch, 2010), foreign aid has also had unintended and/or perverse political consequences in Zimbabwe. Its perverse impacts appear to include the strengthening of ZANU PF’s power and patronage resources and arguably a weakening of opposition forces or the shaping of an opposition ill-suited to transforming authoritarian rule. Recently, while reading The Anatomy of Terror (2011, anonymous, to protect researchers and informants) – a fascinating document that examined ZANU PF militia bases’ organization, resources, and personnel through detailed studies of 15 selected constituencies – I learned that some high profile international NGOs had their aid partially or fully hijacked by ZANU PF since the signing of the GPA. In some constituencies, the study noted, the operations of the international NGOs (INGOs) were “judged to be entirely ZANU PF run”, while in others aid distribution was compromised. The list of INGOs included Environment Africa, Mercy Corps, GOAL, Catholic Relief Services, Oxfam GB, and World Vision. The report also identifies local NGOs’ projects which have been compromised by ZANU PF intervention in aid distribution. Since most local NGOs survive primarily on foreign donor funds, such aid diversion is also relevant for this discussion. Based on the report, INGOs which operate in ZANU PF-controlled districts and use local councilors and traditional authorities to distribute aid are prime candidates to have their aid hijacked by ZANU PF. In ZANU PF-controlled districts, these institutions are run by ZANU PF loyalists. But aid channeled through MDC councilors, as in particular wards in Zaka West (Masvingo Province), was also apparently captured by pro-ZANU PF traditional authorities. In at least two other cases, individual strongmen were able to redirect aid from its intended beneficiaries to ZANU PF loyalists. One example comes from Buhera South (Manicaland Province) and involves Joseph Chinotimba, a losing House of Assembly candidate in 2008 and a notorious “war veteran”. The report, like many others, describes him as having been directly involved in multiple rapes and two murder cases and also as a leader in urban company and farm invasions after 2000. He reportedly set up a committee chaired by a ZANU PF chief to control the entry of NGOs into the constituency. According to the report, Chinotimba acts as if Mercy Corps’ borehole drilling project belongs to him: he distributes the organization’s equipment to beneficiaries, claiming the funds and clean water assistance come directly from him. If The Anatomy of Terror is accurate, what should be the response of the organizations whose aid has been diverted? Article 16.4(b) of the GPA forbids NGOs to provide humanitarian assistance that discriminates on the basis of political affiliation. Should affected NGOs invoke the GPA prohibition against the partisan distribution of humanitarian assistance whenever and wherever it is violated? Should they threaten to suspend all their other projects in the country if aid diversion occurs in select areas? Should they at least publicize who is diverting aid and where it is being diverted? If they maintain a silence about non-transparent aid distribution, how do we even know how widespread aid diversion is? How should they balance their organizational interests in maintaining their projects, the jobs they provide for locals and international staff, and the benefits they provide to locals in some areas against the direct role their aid has had in bolstering the local power and patronage of ZANU PF henchmen? The writing of a new constitution, a referendum on the draft constitution, and then an election are key components of the GPA. The constitutional outreach program, an important step in the constitution-making process, was designed to solicit the preferences of the population. The model for the constitution-making process agreed to by the three principals in the government was that Members of Parliament (Senators and House of Assembly representatives) would head each outreach team. Between June and November 2010, the outreach program made Parliament inactive as MPs earned handsome per diems from foreign donors, over and above their MP salaries and allowances. In January 2010, SWRadio Africa published a list of perpetrators of political violence associated with the 2008 presidential election run-off who would be involved in the constitutional outreach program. Of the 44 named perpetrators along with details of the ways in which they were involved in electoral violence, many were ZANU PF Senators or MPs or ZANU PF candidates who lost in the 2008 elections. Objections were raised about UNDP, a major funder, paying per diems to known perpetrators on the teams, the issue being that it fostered impunity and lack of accountability. But at least according to ActionAid Denmark, the political impact of multilateral and bilateral foreign donor support for the constitutional outreach program was significant for reasons beyond funding individual human rights violators. If an unintended consequence of the donor-funded constitutional outreach process was indeed to facilitate ZANU PF’s re-building of its rural influence, donor support for democracy-building backfired. Should donors treat all governing parties in an even-handed manner in their democracy promotion programs, even when it means supporting a party that has shown no signs of abandoning its authoritarian agenda and strategic use of political violence and intimidation against its opponents? Bilateral donor funding of the outreach program meant at least indirect support for many ZANU PF MPs and other ZANU PF leaders who are on Western sanctions’ lists because of their involvement in human rights abuses – and, according to the January 2010 list published by SWRadio Africa, still other ZANU PF leaders who were central organizers of local level violence in 2008 but seem to have escaped Western sanctions. How do donors reconcile support for the constitution-making process with at least indirect support for those on Western sanctions’ lists? These broad brush claims about the impact of donor aid on domestic organized opposition need to be supplemented or checked against more detailed examinations of specific organizations. The coexistence of a remarkably subdued population and an opposition movement that had plenty of donor support requires careful analysis for its lessons for organized opposition and democracy-building programs. Did donor support unintentionally contribute to creating an opposition movement that is not only donor-dependent but also ill-suited to the type of opposition movement needed to confront authoritarian rule in the rural hinterland? Humanitarian aid has been critical to the revival of basic service delivery, including health and education. Most of this aid does not go directly to the government because Western bilateral donors would like to see more government progress in the implementation of the GPA. At the end of 2010, some INGOs told me that they looked forward to the normalization of donor-government relations as they were accustomed to working with governments in other environments. Donors have now committed funds to the African Development Bank for projects that do provide more scope for government involvement. 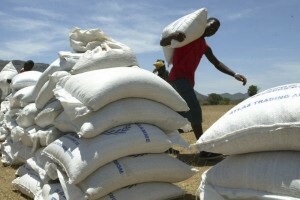 While criticisms of donors for not directly funding the government abound, internal and external actors rarely, if ever, voice criticism of humanitarian aid for helping to keep alive a government (albeit primarily “one section of it” as ZANU PF is often referred to in diplomatic parlance) that has failed to adhere to most provisions of the GPA. An unfulfilled provision of the GPA relates to the provision of humanitarian assistance to internally displaced people (IDPs), yet one seldom, if at all, hears the international humanitarian community even raise the issue. Article 16.4 (c) of the GPA stipulates “that all displaced persons shall be entitled to humanitarian and food assistance to enable them to return and settle in their original homes and that social welfare organizations shall be allowed to render such assistance as might be required.” IDPs constitute as many as almost 8 per cent of the population (1 million people), making Zimbabwe among the countries with large percentages of IDPs. (IDMC, 2010) Most of these IDPs are the product of the previous ZANU PF government’s actions – farm invasions that displaced farm workers, arbitrary evictions of people from their homes in cities and towns, evictions of informal mine workers, and electoral violence. Under the IG, forced displacement continues, chiefly through ongoing farm invasions but also arbitrary evictions in areas of mining operations. When the IG was formed, it showed some openness to addressing issues of forced internal displacement but soon retreated. The IG conducted a small-scale assessment of IDPs with UN agencies in August 2009 but the government has refused to release the results (IDMC, 2010). Unfortunately, the MDC parties seem to have no political motivation to challenge ZANU PF on the issue as the majority of IDPs are farm workers, many of whom are not even registered to vote. So another component of the GPA remains unenforced, and unlike those provisions relating to MDC governmental positions, is largely a suppressed issue. Should the international humanitarian community advocate for IDPs, a group that ZANU PF still apparently prefers to treat as if it does not exist, if seeking government permission to help IDPs might threaten the provision of humanitarian aid to other sections of the population? Another serious dilemma for the humanitarian community is its support for basic services while ZANU PF loots diamond mining revenue for its own party purposes, including paying salaries and providing patronage to the security sector and recently even paying civil servants a salary increase. The MDC-headed Finance Ministry meanwhile is deprived of control of a substantial source of revenue. The international humanitarian community’s logic is presumably that improvement in service delivery (which remains enormously deficient) not only produces benefits for the local population but will redound to the credit of opposition parties which have Ministerial control of services. But the premise is that there will be a democratic election which the MDC will win – a prospect that grows dimmer by the day. At what point does the international humanitarian community say that the economy is generating enough revenue for the government to be able to provide basic services to its population? The politically charged environment in which donor aid is provided in Zimbabwe and the role that aid itself plays in inflaming domestic politics should stimulate rather than mute analysis and debate about the role of foreign aid. The cases presented above illustrate the unenviable dilemmas facing foreign donors in Zimbabwe’s difficult operating environment where well-intentioned aid seems to have unintentionally contributed to weakening the opposition forces and strengthening ZANU PF. The road to hell is paved with good intentions and Zimbabwe seems well along that road for many reasons that have nothing to do with foreign aid. It is important to know if and how foreign aid may have unwittingly pushed Zimbabwe perhaps faster and further along that path and to begin to consider how withdrawal of aid or its redesign may enable taking a less destructive way. ActionAid Denmark, A Gathering Storm: Zimbabwe’s final hope for reform? December 11, 2010. http://www.kubatana.net/docs/demgg/msdk_zimreport_101211.pdf (accessed July 29, 2011). Anonymous, The Anatomy of Terror (June 10, 2011, distributed by Sokwanele). http://www.sokwanele.com/thisiszimbabwe/archives/6800 (accessed July 29, 2011). Gourevitch, Philip, “Alms Dealers: Can you provide humanitarian aid without facilitating conflicts?”, The New Yorker, October 11, 2010. IDMC, Global Overview of Trends and Developments in 2010, March 2011 http://www.internal-displacement.org/publications/global-overview-2010.pdf (accessed July 20, 2011). Raftopoulos, Brian, “The Global Political Agreement as a ‘Passive Revolution’: Notes on Contemporary Politics in Zimbabwe”, The Round Table, 99:411, December 14, 2010, 705-718. http://dx.doi.org/10.1080/00358533.2010.530414 (accessed July 20, 2011).